What does it mean to "act black" or "act white"? Is race merely a matter of phenotype, or does it come from the inflection of a person's speech, the clothes in her closet, how she chooses to spend her time and with whom she chooses to spend it? What does it mean to be "really" black, and who gets to make that judgment? 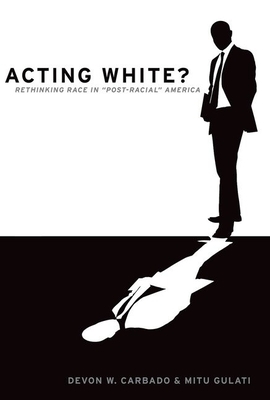 In Acting White?, leading scholars of race and the law Devon Carbado and Mitu Gulati argue that, in spite of decades of racial progress and the pervasiveness of multicultural rhetoric, racial judgments are often based not just on skin color, but on how a person conforms to behavior stereotypically associated with a certain race. Specifically, racial minorities are judged on how they "perform" their race. This performance pervades every aspect of their daily life, whether it's the clothes they wear, the way they style their hair, the institutions with which they affiliate, their racial politics, the people they befriend, date or marry, where they live, how they speak, and their outward mannerisms and demeanor. Employing these cues, decision-makers decide not simply whether a person is black but the degree to which she or he is so. Relying on numerous examples from the workplace, higher education, and police interactions, the authors demonstrate that, for African Americans, the costs of "acting black" are high, and so are the pressures to "act white." But, as the authors point out, "acting white" has costs as well. Provocative yet never doctrinaire, Acting White? will boldly challenge your assumptions and make you think about racial prejudice from a fresh vantage point. Devon W. Carbado is Professor of Law at University of California, Los Angeles. Mitu Gulati is Professor of Law at Duke University.